Technicians! The wait is almost over! 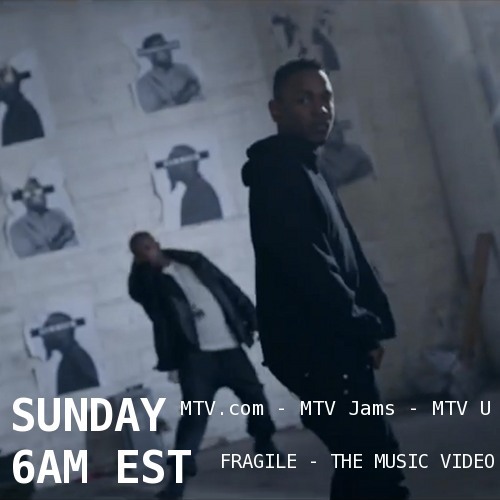 The official music video for “Tech N9ne Featuring Kendrick Lamar – Fragile” is set to premiere on MTV.com, MTV Jams and MTV U this Sunday at 6AM EST. The music video that fans have been waiting to see is finally ready, with appearances by Tech N9ne, Kendrick Lamar, ¡MAYDAY! and Kendall Morgan. To watch “Tech N9ne ‘Fragile’ Featuring Kendrick Lamar – The Performance Cut” go to MTV.com or watch it featured as MTV Jams’ “Jam Of The Week”, where it will play every hour for the entire week. For fans who want to see a more storyline-driven video, watch “Tech N9ne Fragile Featuring Kendrick Lamar – The Director’s Cut” then go to MTVu.com. Watch below for a sneak peek. – How much have you been anticipating this video?